More than five million people have played Sea of Thieves since its launch in March, the maker of the game has revealed. In a blog post announcing the release of the latest update to the popular shared-world adventure title, Rare said reaching the milestone was “inspiring and humbling”. The game has also racked up 300 million views on YouTube and more than 40 million live broadcast hours on streaming service Twitch. 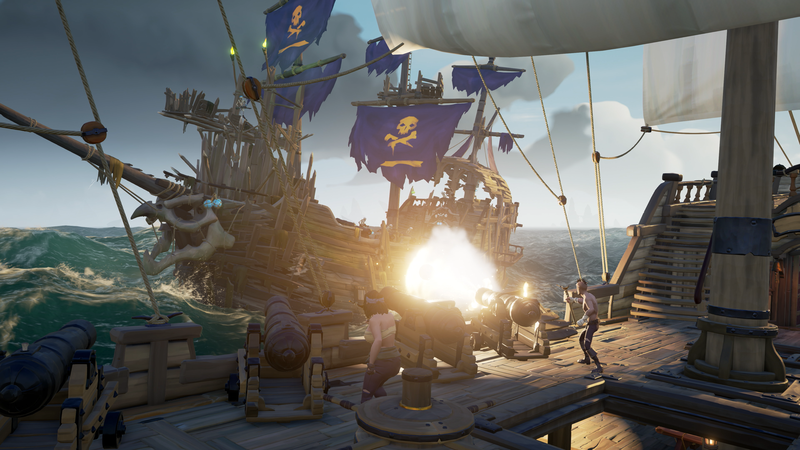 “Seeing our creative community embrace the possibilities that Sea of Thieves presents is an inspiration to everyone at the studio, and on behalf of us all at Rare, I’d like to thank everyone who’s been a part of this amazing adventure,” wrote Joe Neate, Executive Producer at UK studio Rare. Cursed Sails, released on Tuesday, is the second major update for Sea of Thieves. It introduces enemy skeleton ships, a new Brigantine three-player ship and a new Alliance system, which lets players team up and go on adventures together in the game. It follows the release of The Hungering Deep in May, which added the Megalodon sea creature and a new speaking trumpet and flag system to help players communicate with each other. The update also featured new scars and tattoos so gamers could further customize their pirates. A third update, entitled Forsaken Shores, is due to be released in September and will open up a new volcanic area to explore. Cursed Sails is available for free on the Xbox One family of devices and Windows 10 PCs, or as part of Xbox Game Pass.